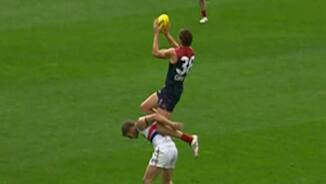 Should Ryan Griffen's point have been judged a goal? The final siren sounds to end the game and the Bulldogs have held on to run out 21 point winners over a much improved Demons line up. BEHIND BULLDOGSDahlhaus kicks at goal but just can't seem to bend it around the right way for goal. Giansiracusa takes it off hands, as his kick at goal goes out on the full. 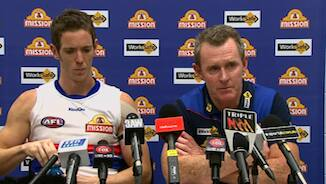 The Dogs will take the points in what has been a highly entertaining and at times an emotional match. A disappointing end to the celebration of one of the Dees greatest ever players. It still can be done, but something special is needed to peg back the 20 point margin. GOAL BULLDOGSThe umpire spots out a free kick as Bate dives onto the back of Wallis 35m from goal directly in front. He kicks his first AFL goal. Such is the pressure of the match, it is filled with turnovers and skill errors at the moment. The Dogs are chipping the ball around in their backline, attempting to ice the clock. With just over five minutes remaining, the Dees need a goal and need it now. The Dogs go coast to coast, as the Dees take the ball away from them. The Dogs are just hanging on. BEHIND DEMONSDunn shrugs the traffic, grubbers a kick at goal and it hits the bottom of the goal post, to bring it back to a 14 point ball game. BEHIND DEMONSGarland swoops on the ball, has a shot at goal but is offline. Scoreboard pressure is what is needed for the Red and the Blue. There is so much on the line for both teams here as nobody wants to start the season at 04. GOAL DEMONSMorton gathers the loose ball, looks up at goal and drills it, we are back to a 16 point margin. Melbourne continue to be hard at the ball, they have the momentum at the moment. There is a general feeling around the ground that the Dees are coming, can they do it for Jimmy? BEHIND DEMONSJones kicks it to the lead of Moloney, who marks on the boundary 51m from goal, he takes the kick and misses. GOAL DEMONSDunn handballs it over to Davey, who brings the house down, their is still some life left in the Dees. 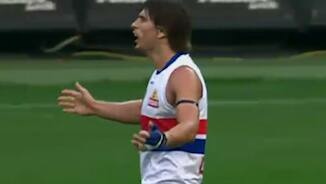 GOAL BULLDOGSSherman handballs it to Giansiracusa, who kicks a running goal, is that the final nail in the coffin? BEHIND BULLDOGSJones gathers the ball, looks up at the big sticks and misses. The Dees need a couple of quick goals and need them in a hurry. GOAL BULLDOGSRoughead gathers the loose ball, snaps over the shoulder and kicks a goal to extend the Bulldogs lead to 22 points. BEHIND BULLDOGSHiggins snaps for goal and misses as the Dees fans breathe a sigh of relief. We are back for the final term, as both teams activate their subs, Melbourne bringing on Tapscott in place of Clark and the Bulldogs bringing on Higgins for Cordy. The Bulldogs go into the final break holding a 15 point lead over the Demons, however don't rule the Dees out yet, as they are coming home strongly. Play resumes as we were waiting for the stretcher to come off the ground after it was signalled off. Clark goes for the mark and almost knocks himself out, as he lands on the top of his head. The good news is that he is back up and jogging to the bench. Melbourne need a goal before 3/4 time just to give them a run on into the final term. They have been great this term and deserve to cut back the half time lead. GOAL BULLDOGSGreat work by Frawley, as he manages to stop the Wallis kick on goal he dives to save it, Jones picks it up and drops the ball, it spills to Djerrkura who snaps truly. 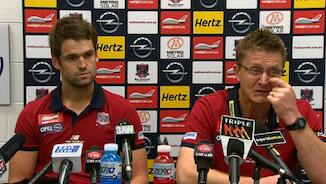 Good news for the Dees, with Clark back out on the ground at centre half forward and not showing any signs of injury. BEHIND BULLDOGSWallis grabs the ball, as he kicks around the corner, but it bounces the wrong side of goal. BEHIND BULLDOGSDjerrkura knocks it over for the safety of the goal line for a rushed behind for the Dogs. GOAL BULLDOGSWatts drops what he should have taken deep in defence, as Grant picks it up and heads for goal, it bounces through. There is a lot of emotion on the ground and it is great to see from Melbourne. GOAL DEMONSSellar handballs it off to Moloney, who looks up at goal and kicks a beauty! The Dees trail by 1 point, can they do it for Jim? Dunn is flying the flag for his club, with his aggressive play, he is really showing some passion out there. BREAKING NEWSClark has gone off the ground and down the race, to have his wrist looked at after an earlier collision. BEHIND DEMONSSellar marks the ball 30m from goal on a slight angle, he stabs at the ball and misses. GOAL BULLDOGSMoloney goes high on Dahlhaus after he kicks the ball, the advantage is paid as Giansiracusa runs into the goal square and kicks the goal. GOAL DEMONSWatts marks 15m from goal on a 45 degree angle, he goes back and kicks a goal, the Dees are within two points. The Dees are playing very good defensive football, they are looking like they may trouble the Bulldogs. The Dees are holding the Dogs at ransom at the moment, but really need to put some more scoreboard pressure on the board. Moloney is awarded a free kick after being held onto, 45m from goal in the pocket. He goes for goal but misses the lot. The Dees are playing some inspired football at the moment, they have the momentum and are doing everything they can to continue their purple patch. GOAL DEMONSBail marks the Clark kick 30m from goal directly in front. He kicks just what the Demons needed, a goal to bring the margin to 8 points. BEHIND DEMONSClark takes the mark 50m from goal, he takes a long shot on goal, he has the distance but not the accuracy. GOAL DEMONSBate finds some space to mark 15m from goal, he goes back for the set shot and keeps the Dees alive. BEHIND DEMONSA good kick from Moloney, as he looks for Clark, but doesn't get him and it skids through for a minor score. The Demons will need to do something special if they are going to come out on top by the end of the game. GOAL BULLDOGSJones gathers it inside 50, has a quick shot on goal and gives the Bulldogs a dream start. We are back for the second half as the Dogs take it out of the middle. The Bulldogs go into the main break with a 15 point lead over the Demons. GOAL DEMONSBate takes the chest mark 40m from goal directly in front. He kicks his first goal of the season and one that the Demons needed. BEHIND BULLDOGSPicken attempts to thread the eye of the needle and is just off target. The Dees continue to push and they need a goal before half time if they can manage it. GOAL BULLDOGSCooney has some time and space, taking an easy mark 25m from goal on a slight angle, he slots it through for his second goal. BEHIND DEMONSHowe takes a quick shot on goal but can only sneak it through for a point. Dunn is starting to get into the game after taking a while to get his first possession for the game. We have had a real goal drought for the last 11 minute, with neither team able to score a major. BEHIND DEMONSBate has a wild shot on goal, but misses. The Dees have not scored a goal since about the two minute mark this term, they need to score a couple more before half time. BEHIND BULLDOGSMagner runs it through for a rushed behind. The Bulldogs have the momentum and it is really a dangerous time for the Dees, they must get a goal against the trend of play. Cordy presents himself as an option in the forward pocket, he marks 45m from goal. He takes the kick for goal and it falls short as the Dees clear it away to safety. GOAL BULLDOGSSherman kicks towards the goal, two bounces and it is over the goal line. The Dogs are up by 15 points. GOAL BULLDOGSCooney is taken high by MacDonald and the umpire awards a free kick 20m from goal on a slight angle. The Doggies make them pay. Cordy spears his way through, but the Demons ferocious tackling continues. The Dees have been impressive in this second term, their tackling has been second to none. BEHIND DEMONSTrengove is taken high by Cross and the umpire awards the resulting free kick 40m from goal on a slight angle. He starts it out left and it stays there. GOAL DEMONSClark can't take the mark as it spills to Davey, who kicks around the corner and goals. The Dees are back within four points. BEHIND BULLDOGSDahlhaus takes it inside 50, has a shot on goal and hits the post. We are back for the second term, as Minson gets first hands on the ball. The siren sounds to end the first term, with the Bulldogs going in with a 9 point lead over the Demons at the first break. BEHIND BULLDOGSGriffin enters the 50, lets loose from 40m, but it brushes the pad of the goal post. The umpires consult and determine that a review is not needed and a behind will be awarded. The Dogs are infuriating fans with their chipping of the ball around the back line. The Bulldogs defensive work has been good today, however there is the questionable move of Roughead on Clark. The Dees would love to add another goal onto the scoreboard, before quarter time is upon us. BEHIND DEMONSThe ball comes off hands for a rushed behind for the Dees. GOAL BULLDOGSDahlhaus has been taken high 30m from goal, he takes the free kick and drills it. The Demons have dominated the last five minutes, but yet only managed two points out of their forays forward. BEHIND DEMONSAddison pushes Howe in the back 30m from goal on a slight angle. He sprays the shot across the face of goal. BEHIND DEMONSClark gets out in front of Roughead and takes the sliding mark 35m from goal, he comes in and misses. BEHIND BULLDOGSGrant bounces a shot at goal and it just bounces the wrong side of the goal posts. GOAL BULLDOGSGrant pops in and takes the mark 25m out directly in front. He did his absolute best to miss the shot on goal, but in the end squeezes it through. The weather has eased up, but the damage has been done, in terms of slippery conditions. GOAL DEMONSClark leads and marks 40m out directly in front. The man in Jim Stynes former number 11, drills it to give Melbourne the lead. The Dogs have the ball 30m out from their goal, but it is a very scrappy game so far, with neither team really dominating play. The rain is starting to make conditions very slippery as predictions of a low scoring match are starting to look the way. BEHIND DEMONSWatts marks 40m out on a slight angle, he goes for goal, but hooks it to the left. The rain is pouring down as the fans head up the aisles for cover. BEHIND DEMONSClark marks 45m out on the boundary, he takes the kick for goal and misses. Melbourne face a hard run over the next few weeks, so a win is a must here. GOAL BULLDOGSDjerrkura hands it off to Griffin, who runs into 50 and kicks a goal. The Dogs draw first blood. This match means a lot to both teams both starting the season of winless at 0-3. We are under way. The subs are Tapscott for Melbourne and Higgins for the Bulldogs. The match will be one of a lot of emotion being the Jim Stynes Tribute game. Welcome to the MCG for the match between Melbourne and the Western Bulldogs. There is one late change for the Dogs, with Austin making his Bulldogs debut in place of Markovic.